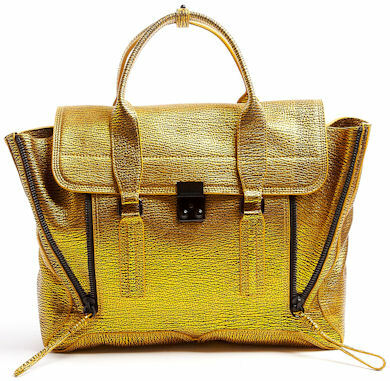 This 3.1 Phillip Lim Pashli Bag in metallic gold is an opulent calfskin satchel bag. It has a two grab handles, a flap over top and black metal hardware throughout. To the front there is a push lock closurre. There are two zips down the front which allow the bag to be increased or decreased in size when they are unzipped or zipped. 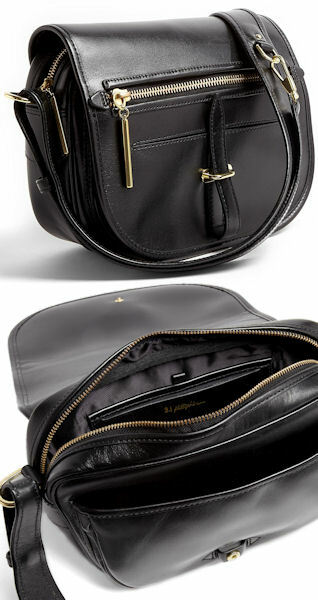 Inside, the bag is lined in black stain and there is a zip fastening gold leather pocket. Get ahead in the new season opulent trend with the decadent metallic gold calfskin satchel from 3.1 Phillip Lim, which will add a touch of polish to your daily look. 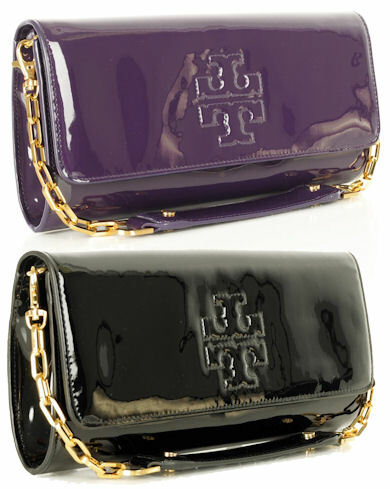 The bag is roomy and practical whilst looking totally gorgeous at the same time. It also works well for evening use too. 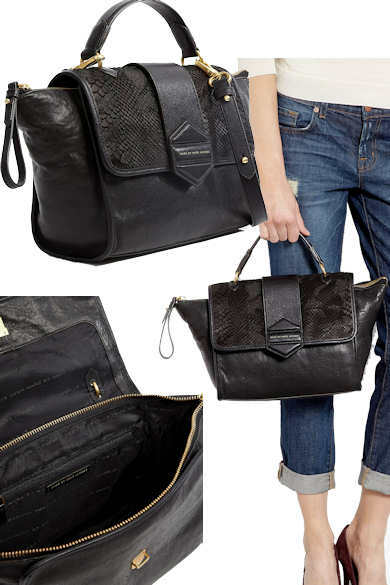 The Marc by Marc Jacobs Flipping Out Bag is a soft black leather tote bag with snake print embossing to the flapover top, which is embossed in gold with the brand name and has a concealed magnetic fastening. 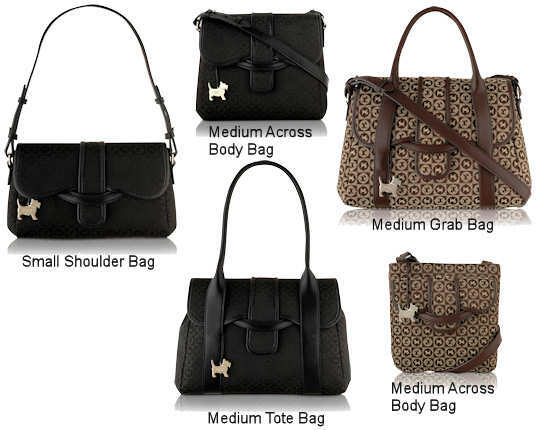 The bag has a single top handle and a separate removable, adjustable shoulder / cross body strap. Underneath the flap, the bag has a top zip fastening, with a long looped zip pull. All the hardware on the bag is gold tone. Inside, the bag is fully lined in branded black satin and there is a zip pocket and two open pockets, together with a gold embossed brand leather label. Measurements: 28cm / 11.1″ x 20cm / 7.8″ x 13cm /5.1″. All measurements are approximate. 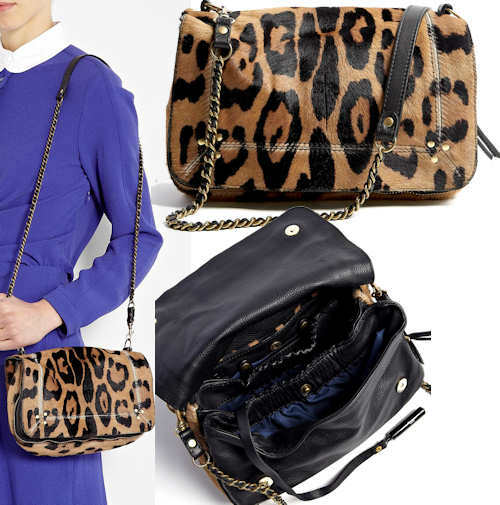 Nod to this season’s trend for animal prints with the subtle snake print embossing to the flapover on this bag. It’s a great bag to carry directly in your hand or wear over your shoulder, and it’s versatile enough for on and off duty use, making it an ideal candidate as a daily use bag. I love the new season shape and the depth of the bag makes it surprisingly spacious. 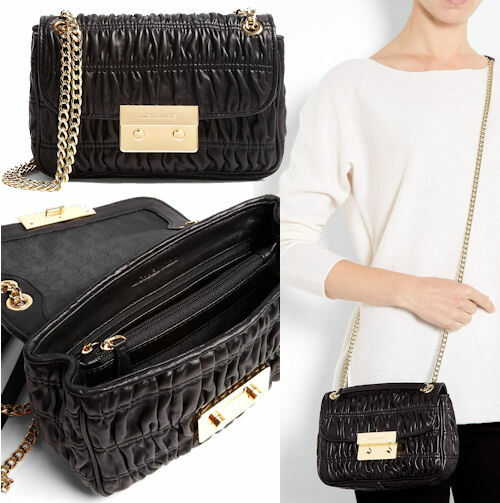 The Lara Bohinc Apollo Python Bag is a luxurious shoulder bag with signature gold tone hardware throughout. 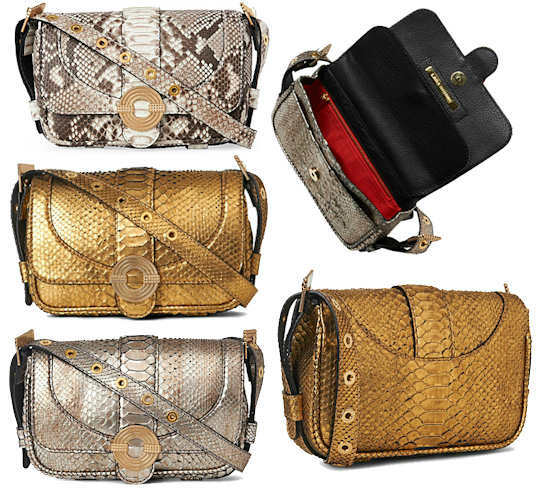 Available in metallic gold or platinum, or natural python, the bag is a flapover style with a magnetic fastening. The bag features an adjustable shoulder strap and the Apollo logo is on the flap. Lift up the flap to discover a front slip pocket; inside, the bag is lined in red canvas and there is a zip fastening pocket. There is also an embossed brand plaque under the flap. For girls who like to carry luxurious things around with them on a daily basis, look no further than the awesome python Apollo bag from Lara Bohinc. It is the very embodiment of luxurious materials and is bang on trend for this season’s opulent look. Suited to day or evening, this investment purchase will last you a lifetime.